Remodelaholic | My Living Room, Finished or Not! My Living Room, Finished or Not! I have noticed quite a few bloggers going through their goals from last year and checking them off, and it sorta makes me want to cringe. Because, I am afraid to look at my goals. I wrote them while I was nesting. The world was my oyster, I was no longer dealing with morning sickness and I didn’t yet have that second baby to work around. I am realizing (hindsite is 20/20) that I am lucky to be alive and still blogging as often as I do with two babies under 2 for most of this last year – so goals-shmoals!The most frustrating part, is that I haven’t shown you so much of what we have done. I just haven’t had that much time to blog about my projects. To add insult to injury, I also have this save if for a rainy day mentality, and then projects never get shared. OR I get to a livable point in a project and get so TIRED of working on it that I stop… and it sits undone for 2 years – and I really don’t notice until I photograph. Then, when I start editing the images, I don’t feel like I can show you. BUT I have to get over it. I am not a professional _____whatever this job is______(fill in the blank). When it comes to sharing my projects, what else is stopping me, besides lack of time? I don’t have new furniture, I haven’t finished fixing the furniture I plan on updating, and we have a budget (well really that isn’t true, we don’t have any more allotted funds for this project at the moment)… and I have toys, spit up and cat hair on my couches, and a HUGE pile of clothes in the laundry room… and that is my life. I am (often) a procrastinator…. I can be a little too laid back about finishing projects on a schedule. I have 2 beautiful girls, a great husband, a black cat… and my yard really needs to be mowed! So many other things to do. I also run this blog, and have an email in perpetual stuffed-ness mode, feels a bit like drowning in email (sometimes I feel like “Uncle Vernon-ing” my little tail to an remote island to get away from all the mail)! I am constantly fighting the feeling of not having it good enough, or changing my mind mid project so I don’t show you what I am up to. But today, I am showing you my living room, I took the pictures this afternoon. There are moldings missing, paint is missing, holes to be patched or sanded, my art is push pinned to the wall… and not in a “I’m too cool to care way”, but in a “Wouldn’t it be nice to have something on my wall, since I bought this… oh well what the heck way…” and there are a lot of things that are unfinished… but here it is. If you wanna see the whole transition here is a picture when we walked through, and some links of the past posts Part 1, Part 2, Part 3, Part 4, Rugs, and Sofas. * I ended up buying a sofa on Craig’s List for $30 bucks. I got a slip cover I got from Uglysofa.com, they have great prices, and are hosting a giveaway here next week!!! So come back! I do plan on recovering the sofa (or replacing it), but for now this is SO much better than it was! Okay, so there. It is out there, missing moldings, no art up, unpainted chair, and free of all the cool things that 2 years old pull off of table tops. I have a few things to do, but I am happy to have gotten this project off my chest. p.s. One of the reason’s the art is not done is because I plan on building a faux fireplace mantel. 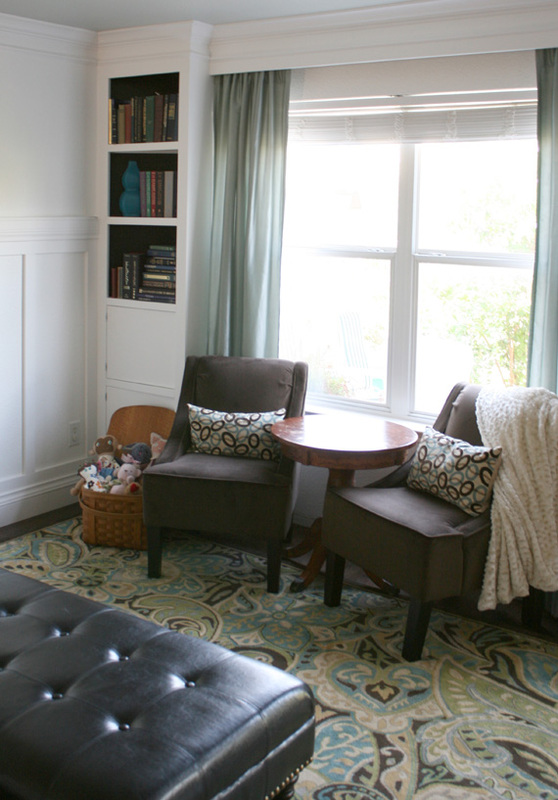 But I just have to say, do you notice how the painting and the rug are like a perfect color match… a happy accident! I am so glad about it. Both were considered for the proper color scheme, but I didn’t know they would be meant for each other! p.s. DID YOU NOTICE THE RUG? If you like this project would you consider sharing it via pin, stumble, facebook or twitter? I would be so thankful! Thanks for reading all my personal drama! This is unbelievable!!! You guys are amazing. I have to ask when do you have time with kids??? I am so trying to figure out a way to balance kids, work, and home improvement. Thanks for sharing 🙂 Please tell me your secrets with finding the time! Karen, we do a LOT of tag team… and A LOT of staying up late after the kids are in bed… but this project was also pretty much completed before I had my second child… one is SO much easier! And I will admit, there was quite a bit of movie watching for a week or two. Good luck! What I have learned with projects is that what works for one, doesn’t work for the next, so you have to be really flexible! Sorry I guess this really doesn’t have an answer, but I do understand! I do love the rug, but assume the giveaway has ended. Where can I purchase one? Your living room is beautiful. You could have fooled me that it wasn’t finished. It looks great! 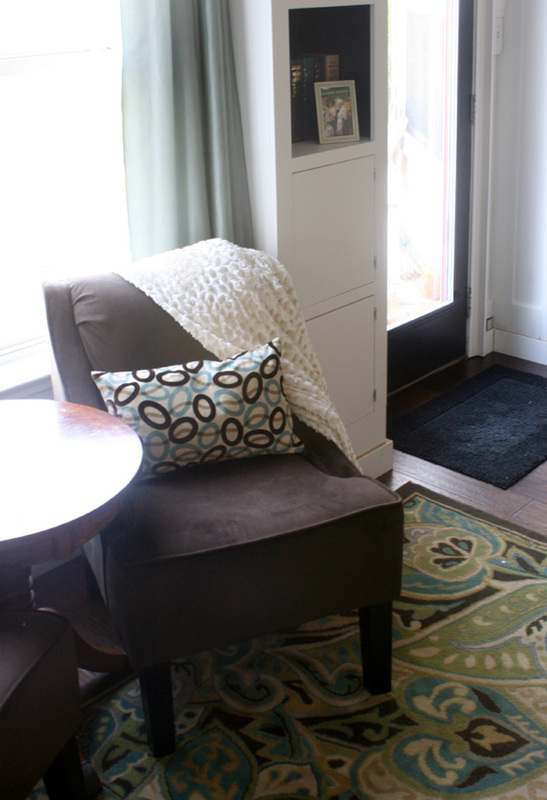 That rug is gorgeous and what a difference the slip cover on your couch made. P.S. I added you back on Google+. What type of flooring is that? Laminate or Wood? And where did you get it. Jonathan, we used Lumber Liquidators Virginia Mill Works 5″, Hand-scraped, Yorktown Plank. It is an engineered hardwood floating floor. We love it and plan on adding it to our bedroom if we get the chance. It has help up really well with lots of traffic and kids. Cathy, I got my cover from uglysofa.com. It is the sofa with a separate seat pocket, then I just tucked the excess between the cushions to make it look more like separate covers. Hope that helps! holy crap! that looks amazing! i have so many projects/unfinished projects and ideas that i swear it drives my husband nuts! i do almost everything my self also. we have such awkward spaces in our house. 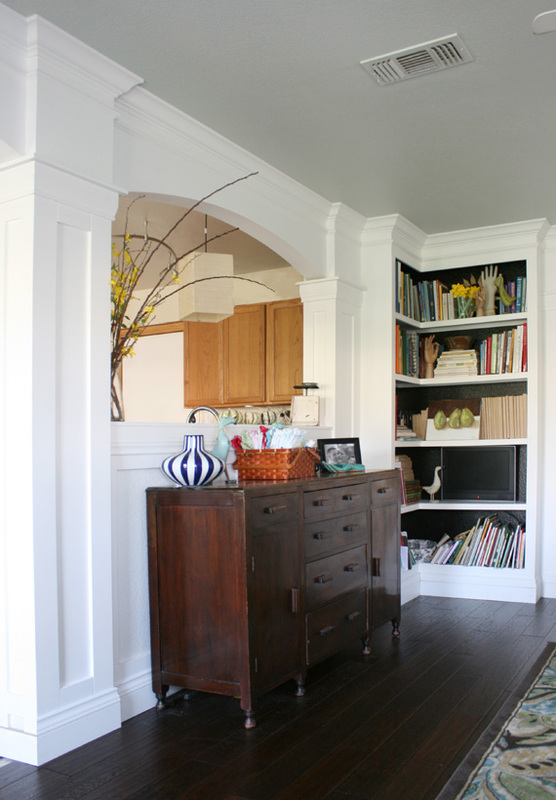 I love all the moldings/frames and built in book shelves. i feel like i should send you pictures of my house and let you design my next project lol! Thanks Lindsay! I wish I could help you out, time is so short, it gets pretty hard! Love the rug! Link didn’t work;-( So please tell me about the rug. The whole room looks beautiful! It is part of the HGTV line by Shaw. Here is the link. That is seriously awesome! We’ve been in our home almost 2 years and I still don’t have any room as a coherent “finished”. If that makes sense. Your living room is just gorgeous! I am so glad I read your post today. I always carry around guilt for not getting stuff done in a timely manner. Guess what, I am not alone! I always look up to the blog girls that get so much done and it looks so beautiful. I love your front room, all of it. Every thing will get done sooner or later. In the mean time enjoy your family and know that you are very talented and human like the rest of us. Lisa! Thank you, so much! Wow, that looks awesome !!! I bet the living room just stays organized while the kids are napping, right? That is the same at our house …. Simply stunning!!! We are often our worst critics…and only you know what is finished and what is not. I think you have done an outstanding job! White shabby chic. But felt inspired to write you a note and tell you, Enjoy your little ones and don’ t be so hard on yourself. You have done an amazing redo of your spaces and am so happy that you have a husband on board. It has taken me 30 years to get my husband to be involved. You are very blessed. I feel that your projects help you define your talents. So, keep them going, just relax the pac. That from a Grandma, who has raised the children, had a banking career, and now am enjoying the sunset years deep into project between traveling to see all my beautiful grandchild. Have a great day. You are awesome . Peggy! You are so sweet, it is so helpful to feel the support of other mothers who have made it through. I know that sometimes it it just the being in the middle of it all that is so hard, but hearing a helpful hint or a “Survivor” story really keeps me motivated. I know I will never regret my choice to be a mother! So I should just enjoy it! I LOVE what you’ve done with this room! Just wondering what color you painted the walls and trim? Also, what kind of flooring did you use? My husband and I close on our first home next week and are trying to figure out paint colors, etc to update the house and make it feel more like our own. Maren, The color that we painted on the walls and trim was a Martha Stewart eggshell base white. They don’t sell that Martha Stewart anymore, but you can probably use any base white. I hope all goes well with the projects. As for the flooring, we purchased from Lumber Liquidators. See this post for details. Thanks. WoW!!!! That looks fabulous! My husband and I are remodeling our entire house on a dime. I am loving every min of it. We have a very long ways to go, but I have a vision as to how I want my home to look and I will get there. He has never done anything other build models, but I’m a little jack of all trades. I especially love restoring trashed furniture. Seeing what you guys have done just gives me more motivation to dream big and go big! Thank you for sharing! Thanks for the love, Jojo! We’d love to see pictures and if you ever have questions, we have a great community of helpful readers on Facebook!